Yes, the 1.2W diode is in a pen. For now. I haven't gotten around to correcting the beam but I'm working on some designs and thinking about the problems. I may not use corrective optics in the end and instead opt for a long focal-length lens. A long FL lens will clip the outer edges of the beam. It will be a type of masking. Bet that pen gets hot quick. That's true unless a large diameter lens is used. It doesn't get hot quite as quickly as you might expect based on power output alone. The low Vf of these red diodes makes them uniquely suitable for compact hosts. Based on the limited data I have on this diode, it is more efficient than the other multi-mode red diodes available to us. One of my favorite builds was a 660nm LPC-815. I ended up selling that one but it could hold 290mW+ (IIRC) for several minutes continuously. You might want to try the LPC-840. I have a build with one doing very close to 400 mW and holds it for several minutes. At least that is as long as I have had it on. I like the tight divergence of all the LPCs as they look the same. You are right about the Vf of the 638nm multi mode diodes. Being so low it doesn't heat up quite as fast as the 405nm diodes do. Thx, Bowtie! Yeah, Oscar likes to get into everything I’m doing. So I guess he helped in a way lol. Definitely knows all about lasers...after nine years he still thinks he’s going to catch that dot lol. He only gets to play with his very low powered cat laser . RA, wow what an excellent array of pens!! Very nice and great photos, too. Thank you so much for sharing your collection! About your cylinder corrected MM pen, that’s pretty cool!! I’m absolutely love-sick about red. Where did you score the round cylinder pair? 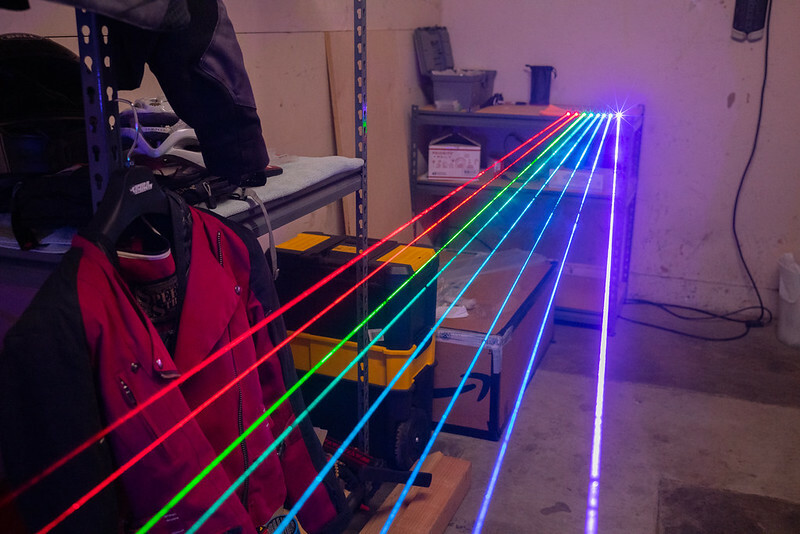 When I first started building lasers, we only had 532 pointers and 660 nm DVD burner diodes. I eventually put together a nice rainbow. I had a 300 mW 660 nm, a 750+ mW 532, a really nice 80 mW 473 nm DPSS, about 8 mW of 589, and a couple 405s around 100 and 300 mW. After a while I sold all that stuff and stopped building and collecting lasers. It's not a cheap hobby. Now there's all this new crap available and so I've already spent $toomany rebuilding my collection after returning less than a year ago. Below are a few pics of my ever growing collection. 660, 638, 532, 508, 495, 488, 450, 405. The 405 is a 2W multimode built by thanhtung. It's the only one I haven't put together myself. I'm still waiting for something around 600nm to show up and I regret not buying one of those 574nm DPSS modules. I think I could stuff one into a pen. So it's funny that it's one of the last to be added to this pen collection since it was the first wavelength I built myself. It's a nice color and I'm glad my camera can differentiate it from 638. Right now it's got a gross plastic lens in it. I think I'll swap it out for a nice 6.7 mm fl aspheric to get low divergence and a bit more power. I'm running it conservatively to get about 250mW. Marvelous display RaPierce!! Thanks for sharing the background and collection!! Beautiful beams!! Very nice RA_Pierce. I especially like seeing the cyans included. Good job. That's a a beautiful pen rainbow you've got there RA, thanks for sharing! Honestly, how good does 532nm look in my opinion it feels 532nm is becoming so under-rated as a wl, i guess because its been around the longest and its cheap as chips, its not so exciting anymore, but wow in these pics it looks fantastic! 532nm is becoming underrated I agree, but for me it is still a brilliant wavelength to own. It will also always be special to me as it was the first wavelength I owned and got me into the hobby. I really like 532. The color is nice but it's the DPSS beam characteristics that really stand out. Now that so many wavelengths are available from diodes, DPSS is under-appreciated. That's understandable, though, considering the extra expense and low efficiency. The 532 shown here is one I put together using a slightly modified Z-bolt module with an aspheric lens. The beam quality is superb and is very stable - not something I often see from the cheaper modules. Divergence is good and at the aperture, the beam is around 1.5mm with a nearly perfect round profile. It just looks so crisp. It's one of my favorites. I should put together a real review of the module sometime. You have a great pen collections of lasers, Pierce. 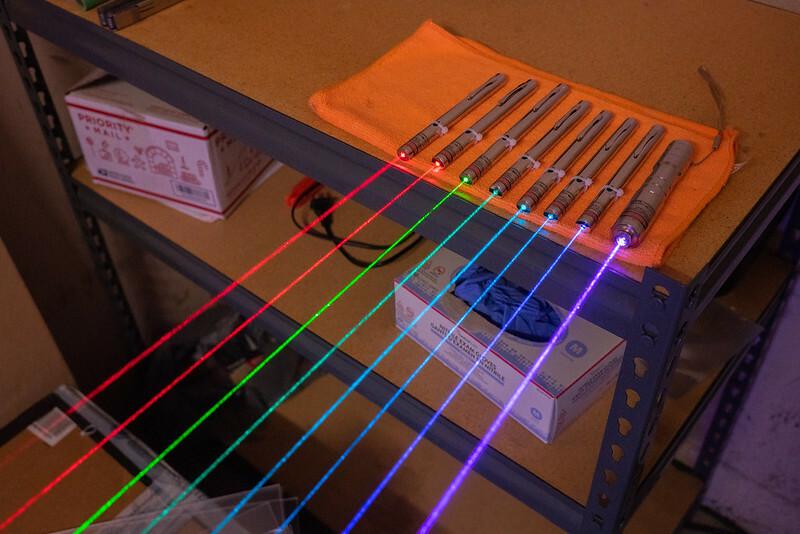 I know many members have said they don't like the 532nm wavelength as much as the 505nm, 510nm, 515nm and so on. I still love this wavelength too. I have a 1300 mW version that is TEM00 and very stable. I have many versions in pens, handheld and labbies, all with great divergence specs. Thank you for sharing your collection with us here. It was a real treat to see them. 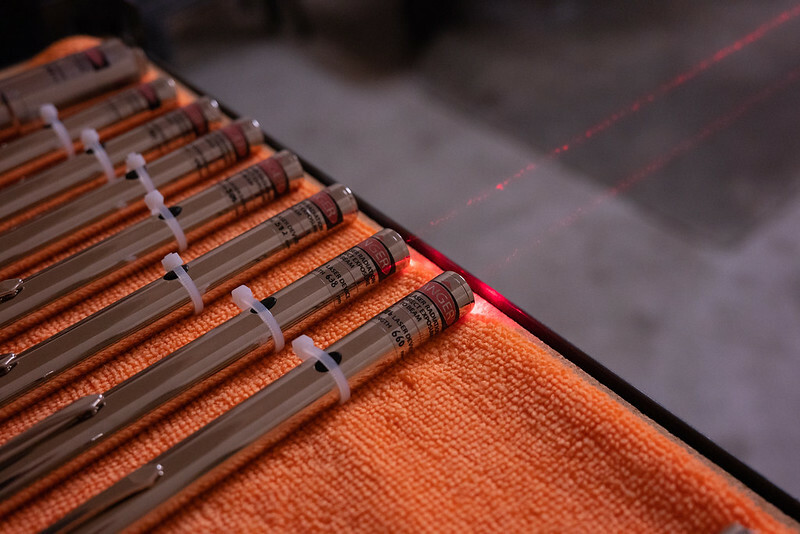 Is that 1300 mW laser a bench-top setup or portable? I think how exciting a particular wavelength is really depends on novelty. Of course personal taste is a factor as well, but if we started with any wavelength - take 405, for example - we would get excited for whatever came next, even if it was something like 660. It seems to be this way with 532. It's common and has been around for quite a while now, so it's not that exciting. Having a collection of many wavelengths puts things into perspective. After a while, even the new additions become un-unusual (not mundane, exactly, just not as exciting as they were to start). When the superficial novelty of a new color wears off, the other characteristics start to take precedence. I find that whenever I feel like walking out the door with a laser, I gravitate toward 638 and 532. The high visibility even in sunlight and the nice beam quality goes a long way for me. The new breed of green and blue diodes are cool - I really like my 495 - but the technology still lags especially where beam quality is concerned. With that said, I really can't wait for a 600nm diode. Orange is one of my favorite colors but it will probably be the last one to make it into my collection. If only 593 wasn't so temperamental. 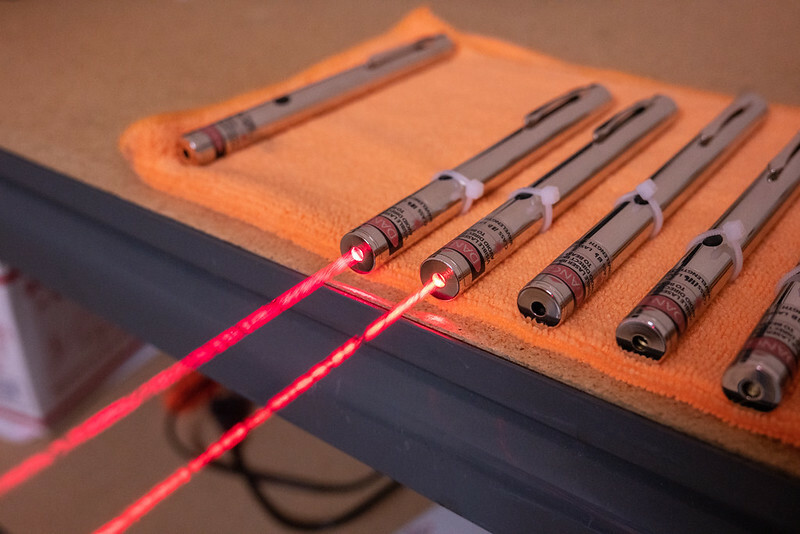 My 1300 mW 532nm laser is a large lab laser. It is TEC temperature controlled unit that has an unlimited run time and great stability. I like my lab hosts every bit as much as my handheld ones. More so, in some cases. 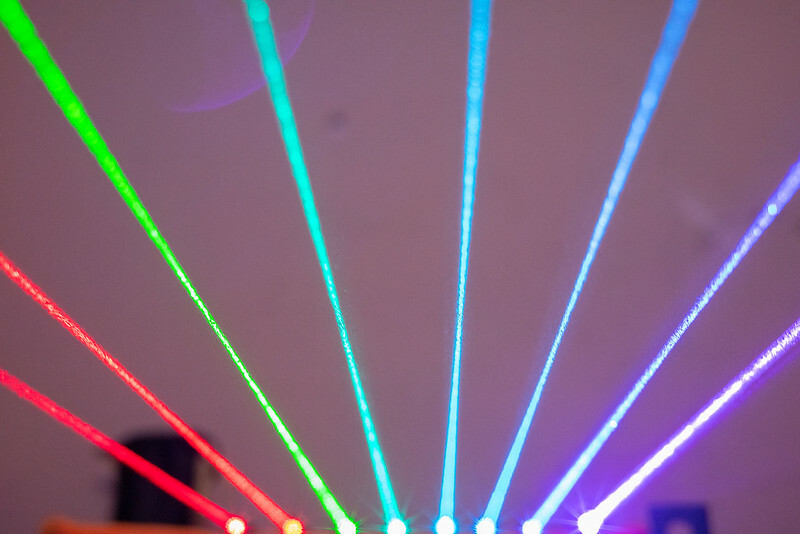 I still get a thrill from building a new wavelength laser. That is why the newer Sharp diodes have been such an enjoyable venture for me. I made a point of learning all I could about all these new diodes.